Gifts from the Pirates: "A person who never made a mistake never tried anything new." Yesterday was the first of many Goonies style adventures and it turned out more of an adventure than Seth could have hoped for, although Mrs M will strongly disagree on that one. After speaking to one of her colleagues at work this week Mrs M came home and told us about a possible spot to fill our Saturday, somewhere where there was walking, places to investigate and somewhere quiet where we could have a nice relaxing afternoon (how wrong could Mrs M be!!). After Seth's Tae kwon do class was out the way we headed home, Mrs M prepared a picnic and we loaded up the car and headed out. Seth's physio and Occupational therapist have always stressed the importance of exercise so over the Easter holiday we have tried to be as active as we could. 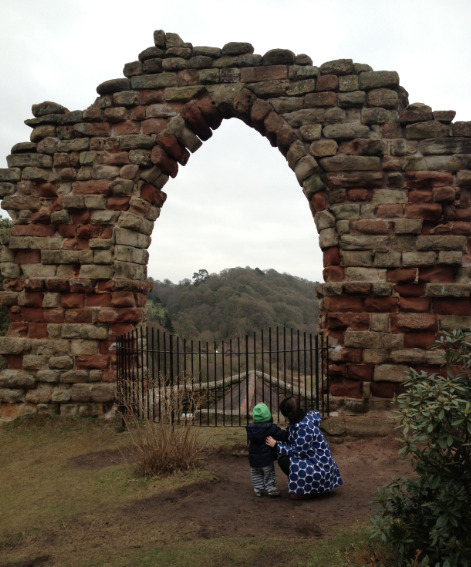 We were heading to Hawkstone Park follies and as i found out pretty quick, if you have a child with Mobility issues, a partner who has a fear of heights and a 2 year old that is in to everything, as beautiful as the place is you really should researched the area. Apparently all spontaneity does is stress your loved ones out. We arrived at lunch time and as it was feeling a bit nippy we decided to have one of our famous car picnics, the words of Mrs M being "well this lovely picnic has gone down like a lead balloon" (always the optimist). I also got told off for taking a picture or the part of the food that wasn't healthy so had to snap away again after this salad was introduced into frame. After eating we headed to the main entrance to pay and get our maps. Opeie miraculously got back a few extra months of his life as under 2's get free admission (come on you've all done it). The woman on the desk was lovely but seemed to make it quite clear that with two young boys we probably wouldn't last the distance and if we didn't make it all the way round then they would stamp the ticket so we could come again, which i thought was lovely, although this is when we started to realise that maybe we had made a bad decision. Me and Mrs M knew as soon as we arrived there that with Seth's muscle condition and his limited mobility we were going to find the walk difficult and probably wouldn't get to far but Seth being the independent child that he is he knew what he wanted and neither of us were going to hold him back. I was prepared for that, we both were but what i wasn't prepared for was the storm of emotions that was heading or way and was going to hit us at great speed. Ive always known that Mrs M didn't like heights but as we had never been anywhere where we were going to be high up i had no idea to what extent, today was the day we were all going to find out. We made it to our first minestone, a small cave in the side of the hill and Seth and Opeie were very excited. Mrs M honestly looked like she was going to pass out and i decided that we should head back. Mrs M is an extremely strong character though, what i love about her the most is although she was clearly very uncomfortable with the situation, shes not afraid to catapult herself further in for the love of her boys, she knew how much Seth wanted to carry on and for him (and Opeie and me) she would do ANYTHING. (how could i not be completely smitten by this woman?). We made our way up the side of the hill slowly, muddy tracks and uneven stone steps were real obstacles for both Seth and Mrs M but with me taking it in turns carrying the boys on my shoulders and Mrs M walking hunched over and trying not to look down we made it higher and higher up the hill passing each one of the maps statues and buildings stopping every five minutes for a rest. It was clearly going to be a long day and Mrs M's mood was slowly deteriorating. ...how did Opeie feel about the overwhelming stress brewing? Seth had packed an 'Adventure kit' that me and Mrs M have been adding to over the last few weeks, i was going to photograph it for the post but i thought i would hang on and write a post just about that. About half of the way to our destination Seth found his first chance to Use his torch in a small cobbled hut and Opeie was obviously feeling the tiredness of being carried everywhere and stopped for a feed. After more walking, carrying and almost getting lost with more sit down rests than you can imagine we finally reached our destination and Seth was one very happy little boy it was a shame that the same could not be said about one of the other members of our party who looked like she was going to cry. We were very VERY high up and the thought of it was causing Mrs M some serious discomfort. The caves were very exciting and Seth said he felt like Indiana Jones. I didn't take any photos while i was in there as it was dark and i was holding on to the boys hands. Mrs M really didn't want to go in so she sat outside which i thought was really brave of her as we were so high up looking over the rest of the follies. Outside of the caves Seth broke out his Adventure kit again and did some dusting for fossils (with a paint brush) and pretend digging at rock with his fold out trowel. He also blew his emergency whistle to try and get help for mommy haha. There was a sigh of relief that we had reached our destination but as they say 'what goes up must come down' and i think this thought was filling us all with dread, well all except Opeie. Seth had had enough of walking at this point so between me having him on my shoulders and Mrs M carrying him on her back we began our mission back to the car. About 10 minutes into the journey back is started to rain and things got progressively worse from there. Mrs M's fear of heights and anxiety had now turned in to anger and frustration, we had not seen anyone else for quite some time (probably had more sense than us to be out, and because it had taken us 4 hours to do the hour walk, due to Myself and Mrs M carrying Seth and having to stop a lot) and it was starting to feel like we were in an episode of lost. We had no idea which was the quickest way back, then a quarter of the way into our journey back there was a glimmer of hope when Mrs M spotted a 4x4 parked up and two park workers, Mrs M rushed over (literally ran the fastest I've seen her run- and she's speedy !!) to find out which way we should head back and came back with a huge smile and a look of relief i wish i had captured on camera. The two chaps had offered to drive us back to the car. ( Mrs M had a huge grin when she came back, saying she'd hitched us a ride) So we loaded the boys in and headed off (not before getting a picture of our heroes though) and just like the end of the Goonies we were saved. As stressful as it was at the end, i had had a great day but when we lay in bed last night, right before she went to sleep Mrs M said "i hated every minute of that".